This entry was posted on 14th October 2016 by admin. 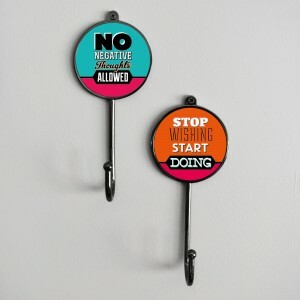 Let yourself and others be inspired with our coat hooks that can have your choice of Inspirational Sayings/Phrases. You can select from 28 different quotes to remind you to get your groove on as you go to unhang your coat in the morning or to greet you as you arrive. Nudge yourself and those around to leave any hang ups behind...pun intended! You can fill your home with positivity whilst creating a feature in your wall. Great for home interiors and can be used to hang items like scarves, hats, coats, jewellery, towels, or a backpack (each hook can hold up to 10kg). Perfect as a birthday gift, housewarming gift, for Christmas stocking fillers or if you are looking to cheer up a friend, relative, a loved one or yourself. Our hooks come with an option of brass or gunmetal black base colour. To view more on these fabulous hooks just click on the image below. We have various other wall hooks so please be sure to view more of our hooks by going to the main menu tab of our main page, hover your cursor over the Home Accessories tab and then click on the word Hooks once the menu expands.